This massive, revised edition of Tomb of the Lich Queen clocks in at 149 pages, 1 page front cover, 1 page editorial, 1 page ToC, 2 pages backer-list, 3 pages of SRD, 1 page advertisement, 1 page back cover, leaving us with 140 pages of content, so let’s take a look! Or rather, let’s recapitulate: The original Tomb of the Lich Queen was intended to be the first installment in a 3-parts mega-dungeon crawl of the old-school kind: Deadly, challenging and unique. The first module pretty much botched in two key components: 1) The whole dungeon was opaque – the lack of maps (which were sold separately) hurt the GMing experience immensely. 2) The massive set-up basically had cool ideas – but it violated the rules. The set-up took away unique tricks of classes sans explaining their lack. The resulting issues were significant. Worse, several of the puzzles/puzzle-encounters had only the “intended” way to solve them – guess how the designer is thinking and you could solve it. Failure to do so resulted in pretty problematic situations. The original book, with its neat art and cool adversaries, sported potential galore, but was one of the most frustrating playtest experiences of my GM career. Thankfully, Savage Mojo got capable hands to take a second gander at the series, which resulted in the third book of the series, Palace of the Lich Queen, being a pretty enjoyable experience. But could they salvage the first book? Let’s see. We begin with the same vast and well-written fluffy legend that serves as a the backdrop for the epic that is to unravel within these pages and begin the game pretty much in the iconic “at a tavern”-set-up. Unlike most such set-ups, a fully-detailed song that proves to be both clue and hook, draws the PCs in – and from there on, it’s Paxcetel looming: The Lich Queen’s domain, a pocket dimension in the Maelstrom. The first thing you’ll note are…MAPS. Granted, no key-less player-friendly versions, but a full-page full-color map of the island nonetheless. Nice! And now that the meat of the module begins, it’s time for the players to skip to the conclusion to avoid the SPOILERS that are bound to follow now. All right, still here? Only GMs around? Great! Exploring the island further increases the prowess of the PCs (herein called “Demigods” as befitting of their lvl 15+ status…) via blessings/curses – you’ll also notice something about the dungeon presented herein – the set-up is pretty much modular. What do I mean by this? Well, let’s take a look at a sleeping gas-trap – it is coupled with the note that the GM should choose 3 encounters and use them in conjunction with this area – a DiY-set-up, which, while more work for the GM, also allows for a flexible customization of the experience. Beyond these, the depths loom – where ancient pictures show scenes from Ayrawn’s life, before she became the legendary lich queen. The tomb itself does provide a massive array of rooms and encounters for the PCs to explore; that being said, the revised version does and does not address the map-issue of the original book. What do I mean by this? Well, for one, the book now does provide small versions of the maps of the respective rooms – however, the maps themselves offer no information on the scale or size of the rooms, which is slightly and can potentially be a bit annoying. I also sincerely wished the book would feature these maps (particularly that of e.g. a room with a floor that shows a picture) in at least player-friendly one-page hand-out size. Sure- the small renditions provided are better than nothing, but for me, they’re still not satisfactory. On the plus-side, the very first obstacle already shows an improvement in design-philosophy: The room sports an extremely complex, huge array of tile-traps. However, the pdf no longer forces the players to play by its rules – they can just fly by, should they choose to. On a nitpicky side, though, this room does sport some issues – for one, the trap fails to note how many Disable Device-checks would be required to clear a path through the room. The obstacle also repeats, unnecessarily, some information, “[…]may make a DC 15 Perform (sing or instrument) check (DC 15)[…]” – which also contradicts itself later: ” This requires either an Acrobatics or Perform (dance) check at DC 15. This requires a DC 15 Acrobatics check or a DC 13 Perform (dance) check.” Granted – this does not break an otherwise cool set-up, as the PCs hopefully dance through the trap to the tune of the ethereal music playing…but still. Such small hiccups render the overall experience not broken by any traditional means, but they do somewhat mar the sense of refinement that e.g. Palace of the Lich Queen, the third part, featured. At the same time, I would be lenient in my duties, were I not to comment on the general quality of the obstacles faced: Concept-wise, the challenges faced are delightfully dire – sometimes even approaching Grimtooth-level of evil. What about, to name just one example, a crushing walls-trap, supported by a floor with spring-laden traps that make movement over the bouncy tiles slow and anyone attempting it, prone to fall? Cool, right? At the same time, while the trap is pretty awesome, there still are some rough patches to be found here – “anyone outside of the room can provide assistance using the Aid Another action.”…yes, generally, that works. I still wish the wording was slightly more concise here. Why? Well, aid another’s text usually refers to melee combat, which is predicated on being close to the target foe to be hampered. I *get* why this was phrased the way it is written and it kind of does work – but in the execution, it could have used a tad bit more refinement. At the same time, while this nitpickery of yours truly may sound bad, the book has made HUGE steps in the direction of being significantly more refined: Whether via spell-terrain-interaction or via similar means of displaying rules-awareness, the trials and tribulations in these pages are quite frankly, simply significantly better crafted than before. Let’s take an example: There is a round that deals damage by action performed via sound application – Invisibility’s bonus to Stealth does not apply here. It’s rules-awareness like this that has been absent from the original version – and it constitutes a significant improvement. What about a room that is essentially a ouija board puzzle? The option to battle the “Champion of Woe?” Of course, the Reclaimers, the creepy wardens of the tomb and the machine below influence the areas and may even return the dead back to life – including e.g. a dragon forever oscillating between being pure and good and a berserking beast. Indeed, the adversaries, from the powerful false lich queen to the hound witch and her unique beasts, to unique demons and the headless horror, this book left me with some rather cool, inspiring adversaries and set-ups. It should be noted, though, that the aforementioned “modular” set-up of the dungeon also results in some components that could be considered unpleasant: For one, the respective rooms and corridors share, at least partially, pretty similar dimensions, which makes the dungeon feel not that organic – sure, it’s constructed and moving…and probably SHOULD feel like a high-fantasy version of CUBE…but some groups may be annoyed by this. A second aspect that deserves consideration is pretty simple: There is, by virtue of this set-up, no map that contains all the rooms, no overlook map. If your players are like mine and try to understand everything, you’ll have your hands full – basically, my players sought to understand the metrics and system behind them dungeon’s configuration – and the book does not perfectly render cues for the PCs to unearth these components. So that may prove to be another stumbling stone for some GMs. Editing and formatting are good – while we still have some minor hiccups and textual redundancies, the rules-relevant components of this book have tremendously improved. Layout adheres to a gorgeous 2-column full-color standard and the pdf comes fully bookmarked with nested bookmarks for your convenience. The book also sports a mixture of great original art and some taken from an obscure 3.X-resource; In any way, the artworks are stunning. Cartography is pretty solid, though not mind-boggling. The lack of a key-less player-friendly map for the overworld is a minor detriment. The lack of hand-out-style versions of the maps for the rooms is a further comfort detriment, but at least a step forwards from the original version. 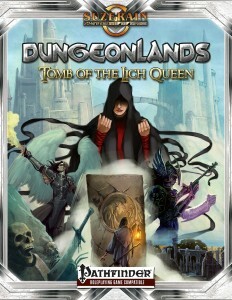 The original “Tomb of the Lich Queen” was the most aggravating mega-adventure I have reviewed – It cheated high-level PCs of their tools of the trade, imposed arbitrary solutions on problems and did not work well with the rules. At the same time, unfortunately, it also was pretty inspired regarding the challenges it posed and while I *really* didn’t like it, I saw ample of merit in the book. The good news first: Jason Allard, Kevin Andrew Murphy, John Wick, Aaron Acevedo, Travis Anderson, Miles M. Kantir, Darren Pearce, Joel Sparks, Lee Szczepanik, Richard T. Balsley, Paris Crenshaw, G’Andy, Vladimir Presnyak and George “Loki” Williams have created a revision that is superior to the original module in almost every way – I do believe that a halfway decent GM can run this pretty smoothly. At the same time, I wished the cartography-support was more pronounced. And there would be one component the better rules-integration has eliminated, at least partially: The lethality of this book. The Tomb of The Lich Queen is still a deadly mega-module; but it’s not as deadly anymore. Where before the book said “You can to do Y.” or “You can’t do Z.”, the new version is a bit too lenient – flight and teleportation can mitigate A LOT of the challenges herein and trivialize some of them. This is okay. I still found myself wishing the book offered e.g. tougher conditions for their use – i.e. make the tricks work, but also make them require skill of the PC’s level. Caster level-checks, flight-spell dispels conditional on flying PCs – you know, the school of evil, hard knocks. Also, as a module itself, the book has NOTHING on the imaginative tour of the Suzerain Continuum displayed in Part III – and to me, it works better as a collection of devious traps and NPCs than as a module. That being said, if used for the former, it is a well-presented collection of nasty obstacles. How to rate this, then? Quite frankly, I expected a bit more from the revision than it delivered. At the same time, I no longer personally hate this book, which should be considered a huge achievement. This is no masterclass-adventure, but it’s a solid one; it’s an even better scavenging ground and may be worth it for the lead-in to Part II and III. (Part II’s review coming up once the revised edition’s done, btw.!) In the end, I will eliminate my ranting on the original; as a module, this is well worth a final verdict of 3.5 stars. For the virtue of a stand-alone adventure, I’d round down. As part of the series and for its scavenging options, I’d round up, though – which is why my final verdict will reflect the latter, rather than the former: 3.5 stars, rounded up by a margin. You can get this high-level mega-adventure/hazard+encounter-scavenging-ground here on OBS and here on d20pfsrd.com’s shop!